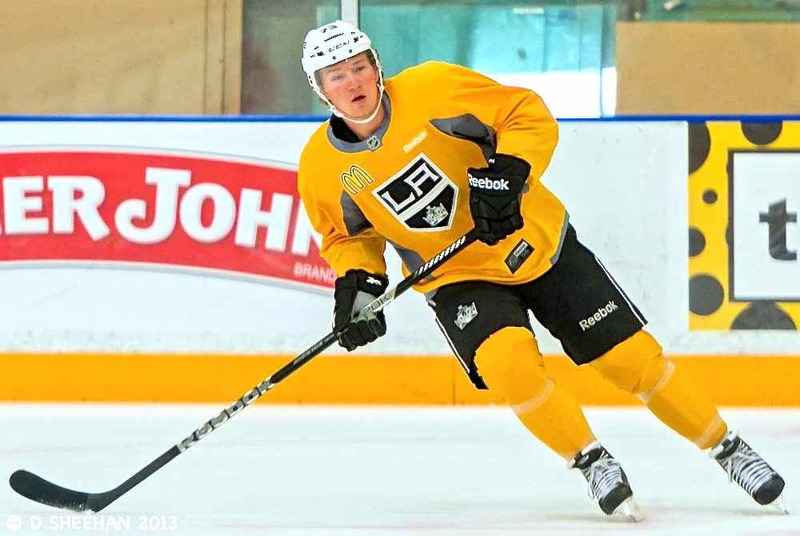 FROZEN ROYALTY EXCLUSIVE: Los Angeles Kings top forward prospects Tyler Toffoli, Tanner Pearson, and Linden Vey made it all the way to the final cuts from the Kings’ 2013 Training Camp before being assigned to the Manchester Monarchs of the American Hockey League. Like all young prospects who are that close to making it to the National Hockey League, they are now dealing with the disappointment of not making the big club’s roster. How is that affecting their play? Exclusive interviews with each player, along with Monarchs head coach Mark Morris, should tell you all you need to know! during the team’s 2013 Training Camp. LOS ANGELES — When the Los Angeles Kings opened their 2013 Training Camp, a widely held belief was that right wing Tyler Toffoli would be a shoo-in to make the Kings’ opening night roster. As training camp wore on, there was also some thought that left wing Tanner Pearson and center Linden Vey might also have a chance to make the Kings’ roster, given their strong showings in camp, and in pre-season games. But when the final training camp roster cuts were released, all three players learned that they would be heading back to the Kings’ primary minor league affiliate, the Manchester Monarchs of the American Hockey League. As with just about every young player who’s knocking on the door, they were all disappointed. Apparently, their disappointment has crept into their first handful of games, just a bit, to begin the 2013-14 AHL season. Morris is concerned enough about their play that he broke up their line starting with practice on October 14. Toffoli indicated that their play has been a bit sloppy. Pearson, who made his National Hockey League debut with the Kings last season, on May 18, 2013, in Game 3 of the Western Conference Quarterfinals at San Jose, said that it was more about how other teams are playing against them than anything else. Morris said that Pearson does not seem to be playing with the same jump as he had during the Kings’ training camp. Morris noted that Toffoli and Vey were in the same boat, but he does not seem to be worried about them being mired in their current funk. Evidence suggests that none of the three players have become discouraged by not making the big club’s roster. Indeed, aside from the natural disappointment of being right on the doorstep, only to fall just short, the fact that they had strong training camps appears to have provided encouragement and motivation. In fact, Vey indicated that his performance in the Kings training camp gave his confidence a boost. Morris pointed to a prime example of what patience, dedication, persistence, and hard work can do for a young prospect, especially those as close to making it to the NHL as Pearson, Toffoli and Vey appear to be. Despite not making the Kings’ opening night roster, as reported earlier, all three players are knocking on the door. All it would take is an injury to a forward, or perhaps a roster shake-up of some kind, to create an opportunity.